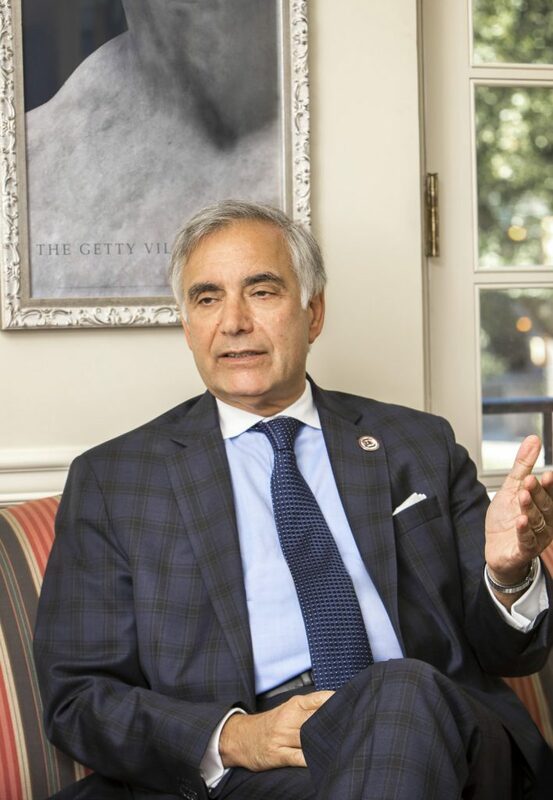 President Harris Pastides, Ph.D., has led the University of South Carolina through a 10-year period of great challenges with resounding success and unprecedented growth. 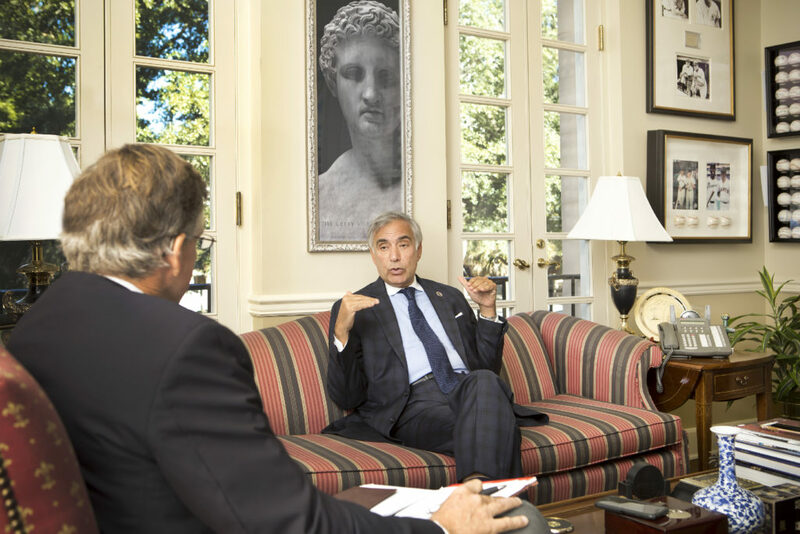 A son of Greek immigrants, President Pastides has exemplified the American dream of anyone being able to rise to their full potential if they work hard and are allowed the opportunity of a good education. This experience is precisely what he has striven to provide for all young people in South Carolina. Several innovative programs have been initiated through his leadership, such as the Gamecock Gateway, which open the doors of higher education to many who would normally not be able to attend. During his decade of service to USC, the Honors College has risen to nation’s best; 47 current undergraduate and graduate programs have gained top national academic rankings; the university has surpassed a $1 billion capital campaign; and, USC has also achieved national victories for the men’s baseball (twice) and women’s basketball teams. Incredibly, more than 100,000 degrees have been awarded statewide during his tenure. Born in New York City, President Pastides obtained his Bachelor of Science degree in biology from the University at Albany-SUNY. He then went on to earn his master’s degree in public health and his Ph.D. in epidemiology from Yale University. Prior to coming to USC, President Pastides was professor of epidemiology and chairman of the Department of Biostatistics and Epidemiology at the University of Massachusetts Amherst. He was recognized in 2016 as one of seven Fulbright alumni to receive the inaugural Global Changemaker Award, which is given to those who have made a lifetime commitment to transform society through their work. 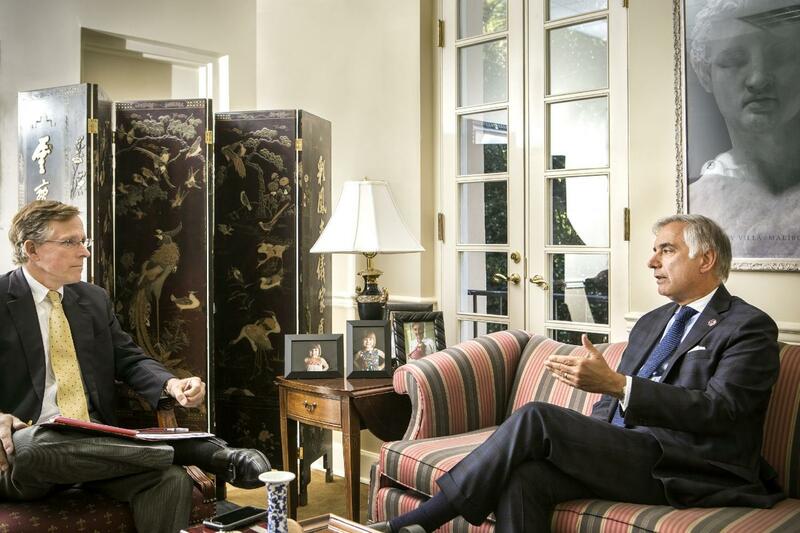 President Pastides has certainly transformed USC. His true concern and paternal love for Gamecock students is evident through his genuine interest and efforts he makes toward them on a daily basis. He frequently takes time to be with them and thoroughly enjoys their many interactions. When he retires this summer, he will be sorely missed, not only by current students and alumni, but by all Columbians who greatly appreciate his service to the flagship university that calls Columbia home. Henry Clay: Thank you for allowing Columbia Metropolitan Magazine this chance to visit and ask you a few questions. To get started, what do you consider the university’s signature accomplishment in your tenure? Harris Pastides: I would say that surviving the great recession without mass layoff of staff, exiting of faculty, or declines in admissions. We dug deep. We tightened our belts, if you will. But, I think I learned that leadership is not only about the mechanics of what you do, but whether you can view a sense of hope in the future. Hope during the darkest days is all we have. It leads to optimism and belief that things will be okay. Beyond that, I can’t help but comment on not only the physical growth of the university, but also the increased stature of our academic programs, as well as our athletics. We went from what I would have considered a very good university to a globally recognized university. HC: What has been your biggest challenge? HP: One of our greatest challenges has been the decline in state funding, which had to be made up by tuition increases — something I wouldn’t have wanted to see happen with the concomitant increase in student debt. We have been as conservative as humanly possible in increasing tuition, but we couldn’t stay steady. The second major challenge has been seeing the national discourse about whether higher education has value. Most of the people who are engaging in that discussion have themselves been to college and continue to send their sons and daughters because they’re usually affluent enough to do that, but for some reason they seem to say that college may not be that important any more. Those two things continue to be great challenges. HC: On the flip side, what will you miss most after you retire? HP: My students. Notice I didn’t call them university students. I am somewhat paternal about them and wherever I see them, we take a moment to high-five, or take a selfie, or wish each other well, and I have become quite sentimental in realizing that those days are about to run out. I’m stopped at all sorts of places. It might be at an airport in Los Angeles, it might be in a restaurant in Hong Kong. Someone will come up and see me wearing my Gamecock clothing and say, “Aren’t you …?” And I say, “Yes.” And it may be that in the future I may find someone with Gamecock clothing and say, “Hey, may I have a selfie with you? I used to be the president there.” I will miss that a great deal. HC: What has been the hardest part about being president? HP: Patricia, my wife, often says, “The years have flown by, but there were some days that seemed to last forever.” Having to notify a family when a student has passed away due to an accident or illness is very difficult. It works both ways — you can’t just take the glory of being a proud parent because if there’s sorrow, you also have to take the grief in being a parent, and those were extraordinarily hard. The other challenge is the 24/7 nature of the job. And, that’s not far from being literally true because we don’t commonly get an evening off, including Sunday. It will be at some level a relief to get some personal time. HC: What are some of your favorite memories? HP: On the academic side, a favorite moment was waking up one morning to be told that our South Carolina Honors College was rated No. 1 in the country, and we have held onto that ranking. That is not something you apply for, it’s not something you lobby for, it’s not something you know you can expect. And then, winning the College World Series baseball championship two years in a row, or the women’s basketball championship, or beating Alabama when they were No. 1 in football. All of those things were terrific. HC: What do you believe are the driving factors behind rising tuition? HP: The decline of state funding coupled with the fact that students no longer are satisfied with my experience of college. That included living in a room with cinderblock wall, a bunk bed, and a fairly dilapidated dresser, with no Wi-Fi. The food was whatever someone in a military style took a spoonful of and threw on your plate. Now the students want amenities. They want Wi-Fi everywhere — and deserve it, let me say. They want teaching assistants and libraries with Starbucks in them, so it’s not your grandmother or grandfather’s type of university anymore. If you go back to the old-fashioned way, you would save some money, but then you wouldn’t have the customers. HC: What have been some of your efforts to lower costs? HP: First, helping students graduate in a timely way. Very few people understand that only about half of American college students graduate in four years, but the average four-year graduation rate in the United States is about 50 percent, and at USC it is about 80 percent. We want to avoid students spending a fifth or sixth year because we don’t discount those extra years. So, if you want to run up a lot of debt, why don’t you change your major two or three times? Why don’t you not take any summer courses? Why don’t you not apply your high school AP courses? We are working feverishly to try to make the four years the outside finish line for students, and I would argue that every freshman at USC could make a run in three and a half years. That’s already one-eighth of your entire tuition, room and board. And then if you could do three years, well that’s 25 percent of tuition, room, and board. So, that’s a major area of focus. The others, of course, are to manage ourselves more efficiently, cut cost where we can, and advocate for more state funding. HC: When you began as president, how much was the state contributing to the university and how much has that changed today? HP: It was about $225 million, which was roughly 25 percent of our total budget/revenue. And now it’s about 10 percent, so we are operating with about 40 percent less state funding. It had gone down to 50 percent but recovered just a little bit. That’s been very, very hard. HC: Can you explain the proposal related to a tax on internet sales as a source of state government funding and what impact that might have on tuition cost? HP: It’s the first proposal that’s led me to be really optimistic in my decade as USC president. First of all, it’s been sponsored in a bipartisan way. Secondly, it doesn’t take money away from anybody, and it doesn’t raise taxes. So, how do you get the money? I think all of your readers have heard of Amazon.com and most probably shop there as well as other online sources. The proposal calls for taking only the increase in tax revenues in a given year from online retail sales and applying those to higher education. You’re not taking a dollar away from anybody who got that money last year. You’re only taking the increase. HC: Those dollars would go to higher education throughout the state? HP: The revenue would be shared with all public universities. USC provides the lion’s share of higher ed — we educate nearly half of all South Carolinians who are at a public college in the state or are at one of the USC campuses. HC: How much is USC dependent upon private fundraising? HP: Very much and growing every year. That provides money for the extras we wouldn’t be able to afford otherwise. Those dollars help students who are on a fixed income study abroad. Studying in Florence, London, Johannesburg, or Shanghai often costs more. And so, a gift made during the capital campaign provides that extra. Many of the construction projects going on have been aided by philanthropy. Breaking the $1 billion mark on our Carolina’s Promise Capital Campaign was a big moment. We’re a small, reasonably poor state, but the alumni and many people who never attended USC participated. HC: How is the Midlands Technical College bridge program working? HP: It’s both an economical way to go to school, and maybe more importantly, it’s a reassuring way to go to school. We call it the Gamecock Gateway. The students live at USC and shop and eat on campus, but in the morning, they hop the bus to one of the MTC campuses where they have smaller classes, and they come back at night for the other part of the experience. They sock away some hopefully very good grades, and then they enter the university as sophomores. Many students attend Midlands Technical College for two years, earning their associate degree, before transferring to USC and completing their USC degree in a more affordable way that’s better for them. HC: With the increase of out of state undergraduates, are there less openings for in state students? HP: No! I’m so glad you asked me about that. We’ve increased the size of the freshman class to accommodate the extra out of state students. We have never once in my tenure here denied admission to a South Carolinian who could do the work. The out of state students pay on average two and a half times more tuition than an in state student, so really what they do is subsidize the education of South Carolinians. HC: Looking at USC in Columbia, what economic impact does the university have on the city? Our impact goes beyond the economic if you look at the culture we have here. We have Ethiopian restaurants, Korean restaurants, and more coffee shops per capita than they have in Charleston. Although Columbia is not the tourist destination that some other places are, USC’s presence improves the quality of life for all with athletics, theater, symphony, and more. HC: Do you see any programs in the near future on which the City of Columbia and USC would collaborate? HP: Yes, we work closely with Mayor Benjamin and the Columbia City Council as well as with Richland and Lexington county councils. But we need to further develop the riverfront and the area around Colonial Life Arena — to extend to Huger and then to the riverbank itself with 24/7 condos, recreational fields, restaurants, and great outdoor living. That’s something I’m not going to see before I leave, but I’d certainly like to come back someday and be part of that. HC: What effect will the proposed new medical school on BullStreet have on the university and Columbia? HP: It will have a great impact on medical students and medical education for the school to be located in an area that has health care practitioners with whom they can mingle and learn. Practicing medicine means that you need to be embedded in a health care delivery system. While we’ve had a great partnership with the Veterans Administration for many years, the VA has now told us we can no longer use those buildings without paying a fair market value rent. Rather than putting new money and fresh money into renting facilities that are really not up to standard, we want to build the facilities that our students need. We’re excited about what’s happening at BullStreet with the minor-league baseball park and office buildings from which we can both contribute and benefit. HC: What partnerships with corporate America does USC have, and what aspirations do you have for the university in that area? HP: About a month ago we opened up a digital transformation lab and announced partnerships with IBM and Siemens and a robotics company, and Yaskawa and Nephron Pharmaceuticals in Lexington to use robotics. We work with Samsung out in Newberry and with BMW, for that matter, and with Boeing. Universities are often, maybe almost always, a part of the constellation of factors that make a place attractive to grow. They provide the workforce, and they also provide the cultural ambiance that a lot of these highly skilled and highly paid workers like to be in. HC: I know you must feel a great responsibility for the safety and welfare of 50-plus thousand students total at USC. What do you feel needs to be done to create an even safer environment for every USC campus today? HP: Continued alcohol education. I certainly would add drugs to that as well. American culture and Hollywood culture have made it very believable that when you leave high school and go to college for the first time, even though you’re not of age, that you’re going to party, and many of those young people don’t have the restraint or self-control to understand what binge drinking is and how it affects you. That’s a terrible problem. It’s a hard one to combat. It’s kind of like saying people should vote. Of course, they should vote. But, why don’t more people vote? Year after year after year after year. Why do college students drink to excess? Not all of them by any means. But, too many of them, and so I think it’s important to emphasize education and better enforcement of rules. Beyond that I’m concerned with the enforcement of pedestrian traffic with the attention to the smartphone. We did a survey recently of students walking on campus including crossing streets, by the way, and found that 70 percent of students between classes who are moving around are on their smartphone either looking, or talking into it. Seventy percent! And many of them will continue to do that as they cross Assembly Street. And Assembly Street and Pickens require you to be fully aware: your eyes, your ears, your mind, your sense of what’s happening around you. And so, we’re concerned about all of those things. I think if we continue to clamor about pedestrian and traffic safety as well as the other side of alcohol and substance abuse, we’ll hope to do better. HC: What do you think needs to be done about Five Points? HP: We took a big and positive step by working with the city government to enforce the laws we already had. So, let me be clear: we already had the laws. If you’re staying open late at night, you are going to provide food. You need to be more than just a purveyor of cheap liquor. Number two, we need to work on mitigating these horrific drinking specials like $10 for an hour of drink all you can. I mean that needs to be illegal. But, you know, this is America and that’s an infringement on people’s right, if you will, to make money. Beyond that, I think better patrolling and better transportation. We are criticized at some level for not shoveling students to and away from Five Points as well as for doing it and for not doing it. Because some people will say, “How can you let kids drive down there?” And, some will say, “How can you bring them down there?” And so, that’s a hard one, but I do think this year has seen some good progress. HC: What is your favorite place on campus? HP: I can’t answer it that simply! Monday night I may like to go up to Melton Observatory right up on Greene Street on a clear night and allow a graduate student to show me the planets. That is heavenly, I might say. And there’s a very quiet part right off the Horseshoe where we have a sundial — it’s called the Sundial Garden. But, ultimately, it’s got to be the Horseshoe. You know that is the historic core and the heart of the university, and I think when I come back in the future that will be the place I run to first.